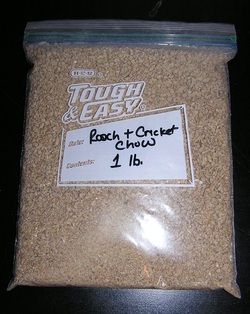 Our roach and cricket chow is ideal for many types of feeder insects. It is high in protein and calcium and low in phosphorous. It contains approximately 10%-15% crude protein, 3% crude fats, 5% crude fiber, 3% calcium. 0.7% phosphorus, and less than 0.15% sodium. 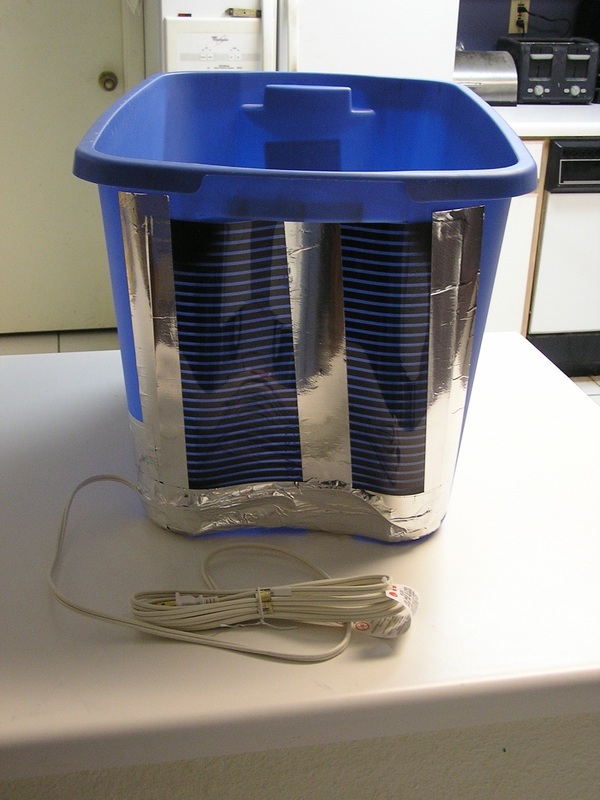 This roach enclosure heater is constructed from a 12" x 12" or a 12" X 18" section of THG heat tape (or a comparable product) with soldered and insulated connections. It comes with 6' of heat resistant aluminum tape. Use the metal tape to securely attach the heat tape to one end of your existing roach enclosure. This heater is constructed to provide an optimal breeding environment of 100° F-120° F. Simply attach to your enclosure, plug in the heater, and watch your roaches breed. The 12" X 12" heater is appropriate for up to a 20 gallon enclosure.The 12" X 18" heater is appropriate for up to a 20-40 gallon enclosure. These are a great dishes for feeding roaches and worms to your bearded dragon or other lizard. 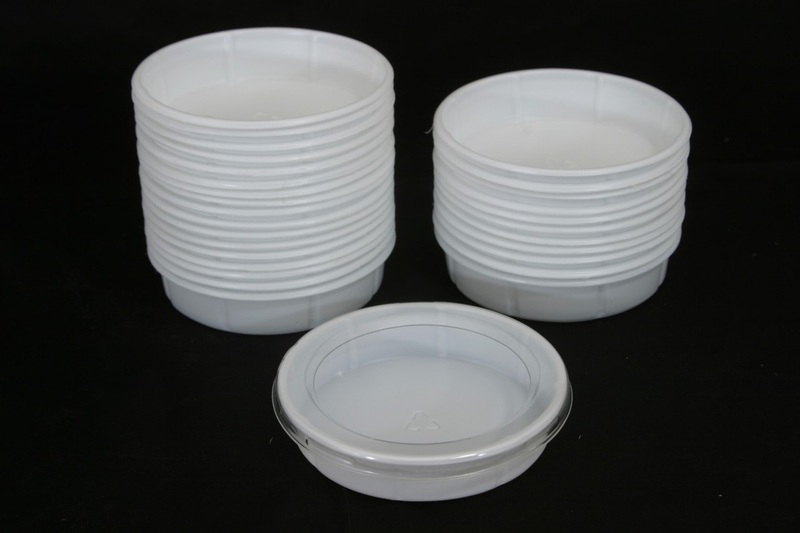 It can also be used as a water dish as it helps to prevent spills.These bowls are constructed with flat bottoms and are disposable and recycleable, but can be sanitized and reused. The snap-on lids (rings) are constructed with the centers missing to to prevent the insects from escaping while allowing access to the insects. The Small dish is 3 1/2" in dia. and has an opening of 2 1/2" which is appropriate for young bearded dragons, geckos, and other small lizards. 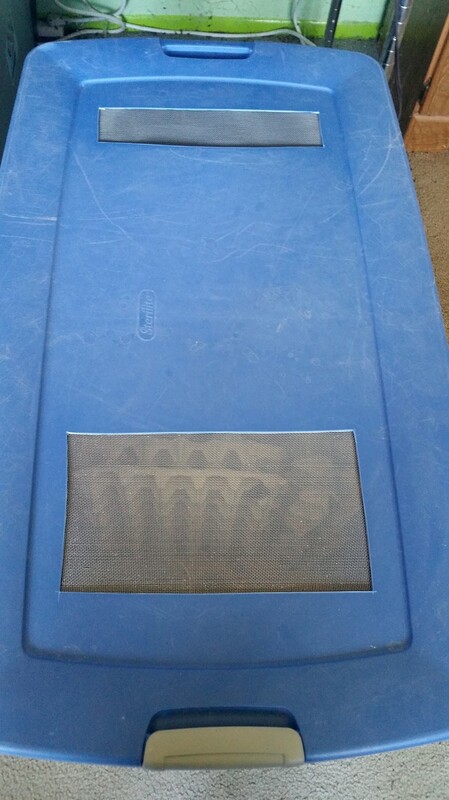 The large dish is 5" in dia. and has an opening of 3 1/2" which is appropriate for older bearded dragons and other animals. Polymer Water Crystals (2 oz) Water polymer crystals absorb up to 400 times their weight in water, and are the main ingredient in most commercial insect and cricket water type products. Polymer water crystals are the perfect source of moisture for your feeder insects. They are non-toxic, help to prevent drowning of the insects, reduce the chances of bacterial contamination, and they can be fortified with calcium or vitamins. They are easy to store and rehydrate, and have an indefinite shelf life until hydrated. Mix 1 tsp with 3 cups of warm water (or 2 oz with 1 gallon of warm water) and let stand for 1-2 hours. Excess water can be drained off or allowed to evaporate. Add more water as needed if the crystals start to dry out. Dry & moistened crystals should both be stored in sealed containers. Save money by constructing your own insect enclosures. This aluminum screening offers the strength and dependability of steel screen without the rust. Insects cannot chew through the screen, and are not affected by UV light, like plastic screens and you can place heat lights directly on top of it. If you would like a custom size screen, please feel free to contact us. The cost will be determined at a rate of $1.50 per square foot. 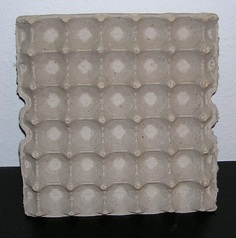 12" x 12" cardboard egg crate flats provide additional surface area for your insects and increases the quantity of insects you can maintain in a single enclosure. 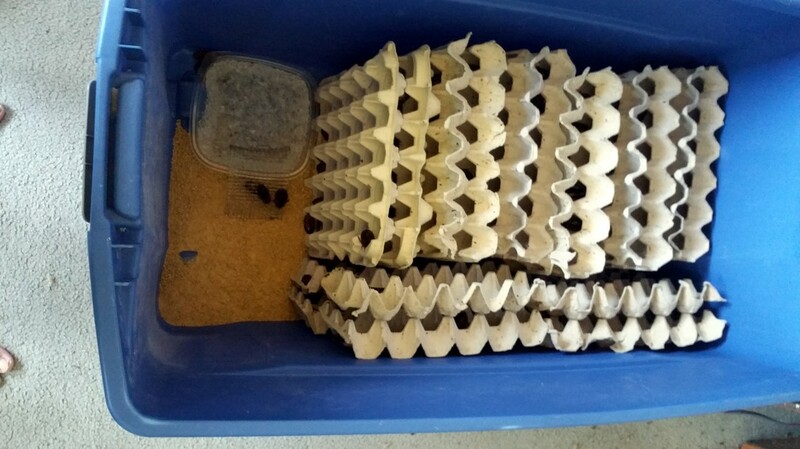 These crates are 5 cells wide x 6 cells long and easily stackable.Cardboard egg flats replace substrate for roaches & crickets reducing the maintenance and making sorting inscets easier. These 4 3/8" X 5/8" Black Polypropylene caps are ideal for holding food and water crystals for your roaches, crickets, and other insects. These Insect enclosures are for sale if you are able to pick them up or at the expos we attend. Unfortunately we cannot ship them due to the excessive shipping costs for oversized packages. We will be adding instructions and pictures so you can construct your own enclosures. We do sell the aluminum screening & heaters which may be difficult for you to find and/or make. All that is needed is a plastic bin which can be purchased anywhere, something to cut holes in the bin, and a hot glue gun. House your roach colony in this self-heated 18 gallon Rubbermaid tote. The top has been cut out and metal screening has been attached. A well ventilated enclosure will promote a healthy breeding environment. 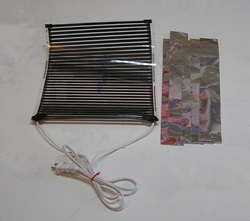 This enclosure is equipped with a 12" x 12"section of THG heat tape (or a comparable product) with soldered and insulated connections. It is securely attached to enclosure with heat resistant aluminum tape to provide an optimal breeding environment of 100° F-120° F. Simply plug in the enclosure, add egg crates, roaches, food & water, and watch your roaches breed. 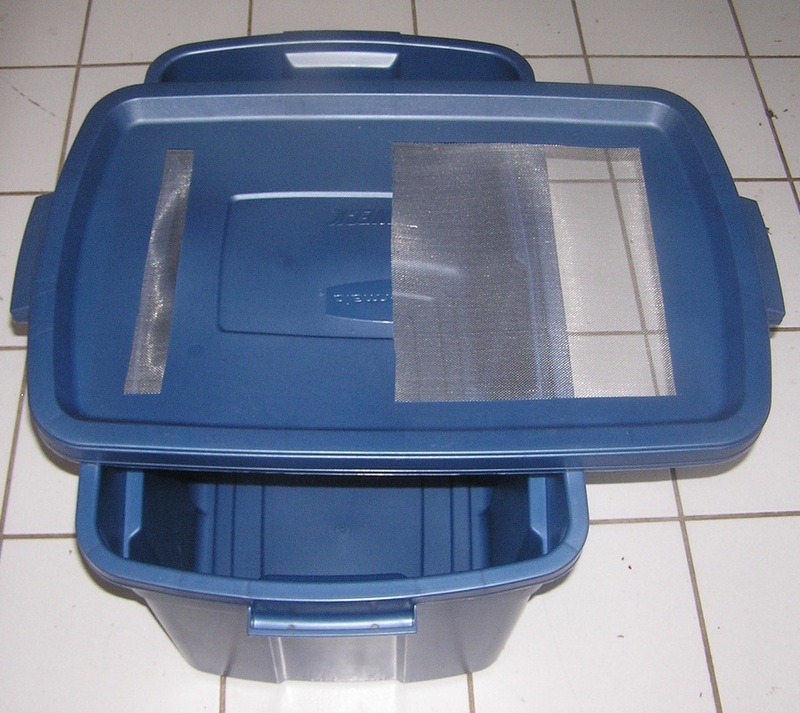 House your roach colony in this 18 gallon Rubbermaid tote. The top has been cut out and metal screening has been attached. A well ventilated enclosure will promote a healthy breeding environment. This enclosure does not come with a heater. House your crickets in this 50 quart Sterlite container. The 3 holes have been cut out of one end and top has been cut out. The holes have all been covered with metal screen. A well ventilated enclosure will promote a healthy environment and reduce, but not eliminate, the smell of the crickets. When you are finished this is how your enclsoure should look and be set up. The end of your tote should be flat so you get a good transfer of heat from your heat source. The heat source needs to be placed on the end so there is a temperature gradient. If you place it on the side or the bottom you may cook your roaches. Your egg flats should be hot glued together in sections of (2) and stacked vertically filling your enclosure except for enough room for food and the water crystals on the cool (non-heated) side. Your top should have a small screened hole and a larger screened hole. The small hole should be positioned over the heated end. 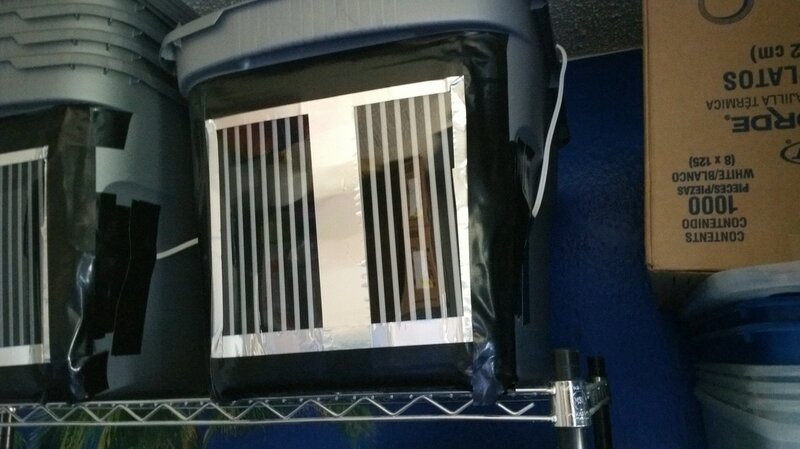 This blocks the light and traps the heat so your roaches breed the best. The large hole should be placed over the cool end. Convection from the temperature gradient circulates the air without cooling down the hot end too much, A single screened hole allows the heat to rise without circulating the air so you will have a stale, cool enclosure.